Picture 156 is superb. The roundabout still exists in 2002 almost exactly as the photograph shows. The road behind the bus is Forest Road, and the houses still look just as they did then. On the right you can see the then new Fairlop Secondary Modern School for boys [my old school]. The trees on the pavement to the right have sadly gone, and have been replaced by Fullwell Cross Library, and Fullwell Cross Baths. The roundabout is known as Fullwell Cross Roundabout, and, not in this picture, but just left of it, still stands The Fairlop Oak public house. Looking down Forest Road, you can see one of the old 1938 red London underground trains going across the bridge at Fairlop station. That's progress for you, you must admit it is so much nicer now with that great stone building and all that filthy litter from KFC. If you were blindfolded and beamed to that spot, the smell would tell you where you are. I was an Ilford resident before and after the 2nd world war. I remember the start of trolleybuses in 1938. Bournemouth Council vehicles were used on the 691 & 693 routes during the war and also they used some wider types that were destined for South Africa, these had darkened glass. I expect site visitors may be aware of these facts if so my apologies, but if not it may be of interest to visitors of this page. I also remember the Bournemouth trolleybuses in Ilford during the war. In 1946, just before my 10th birthday, I went to Bournemouth for a month's convalescence. The journey by train up to London and then from Waterloo seemed to take hours. As a young child I found it very confusing that the trolleybuses running down Old Christchurch Road appeared to be going to ILFORD - they were in fact going to IFORD. Just over a year later I was travelling regularly on the 691, and sometimes on the 25A or 129 buses, to Ilford County High School in Barkingside. I stumbled across your site yesterday [I have just discovered the powers of Google's picture search facility and so took a chance on 'Barkingside' from where I come]. Your site was a remarkable discovery for a former resident of Barkingside and a fan of London public transport. In my experience meaningful photos in the public domain of Barkingside High Street of any description would appear to be exceedingly hard to come by [I would dearly love to get hold of a picture of a Routemaster - ideally, 169 - somewhere in the Barkingside area, but haven't so much as come across a dodgy b/w photo of the 'hopper' buses that they have had running along it in more recent times!]. 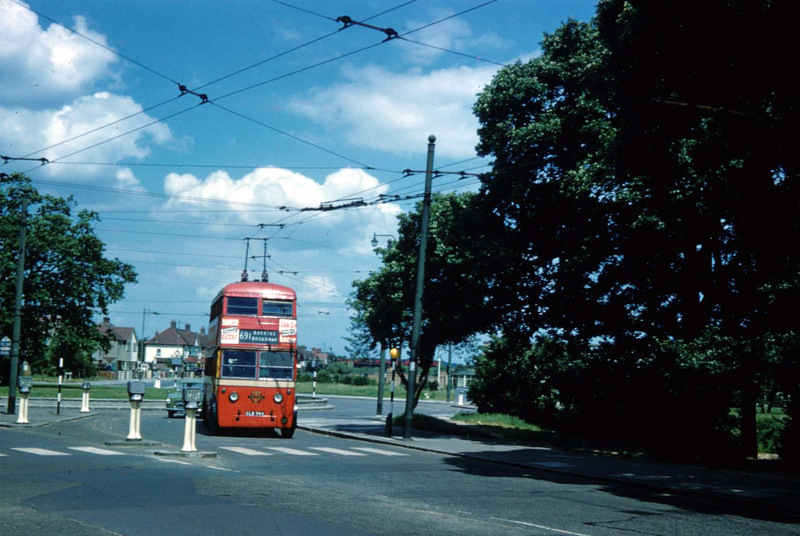 So imagine my delight/amazement to come across COLOUR photos from as far back as the late 50's and of TROLLEYBUSES [it might be worth pointing out that I was born in 1971]! It was fascinating to see how similar the High Street is to today, yet how much calmer it looked. Perhaps of greatest interest were the photos taken of Fullwell Cross roundabout, as this is a fairly distinctive part of the High Street to this day, yet has changed a bit since your photo [fewer trees, library built nearby etc]. Incidentally,the other photos were also very interesting and in my opinion comfortably superior in both interest and quality to the kind of stuff that turns up in London Transport books. I would like to say how much I enjoy your website. It brings back many memories of my school days at ICHS when I travelled from Barking Broadway to Fremantle Road Barkingside from 1955 until the trolleybus run was discontinued in about 1958 or thereabouts as I remember. I loved the leather upholstery, the silence of the run. I have shown the site to my 10-year old Argentine daughter who is enchanted by the clarity of the images. I live in Argentina where in at least two cities [Cordoba and Mendoza] there is a single-deck trolleybus network, also trams in the capital Buenos Aires. What a splendid site, Oh! How the memories come flooding back. I used to go to school in Barking and have to catch the 691 from Fullwell Cross, Barkingside; 1959 that was. Many thanks for the pictures and your site. Born and bred fifty metres from that trolleybus. Played on the bomb site to the right. Very disappointed not to be able to download this and other Barkingside pictures. I came across your site by accident and the picture brought back memories of when I went to Fairlop Boys School in the early 60s. My father used to be a bus driver at around that time, mainly on route 150 and 62. As we lived in Brocket Way, Hainault we would often catch the bus to Barkingside. And I can just remember seeing the trolleybuses which were replaced with the Routemaster buses. Thanks for bringing back the memory, as I have lived in the West Country since 1968, so had forgotten what these buses looked like.